Welcome back everyone! Here we are in 2012. I had an excellent holiday and have a number of fun post ideas that I can’t wait to share with you. I hope your holidays were full of fun and magic. This summer I did a painting of one of my parent’s dogs, Bud. Of their four corgis, he is one of my favorites. When I finished the painting, I almost put it up here, but my boyfriend told me to hold off and keep it a surprise. So I took the excellent advice and waited. I gave it to my mother for Christmas and she loved it. I’m happy to share it with you now. He looks so innocent and earnest. That is what I like best about him. I really enjoyed working on this one. 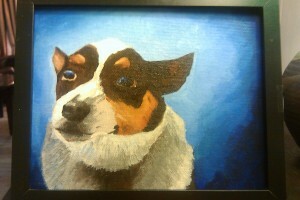 Apparently animal paintings are some of my favorites to do. Hello, i think that i saw you visited my weblog so i came to ���return the favor���.I’m attempting to find things to enhance my website!I suppose its ok to use some of your ideas!! I will immediately seize your rss as I can’t find your e-mail subscription link or e-newsletter service. Do you have any? Please permit me recognize in order that I may just subscribe. Thanks.